Preheat oven to 350˚F. Slice tops and stems off tomatoes. Use knife to cut around inside of tomatoes and loosen ribs and seeds. Scoop out with spoon and discard. Heat butter or oil in skillet over medium-low heat until melted. In medium bowl, whisk together eggs and cream until well combined. Season to taste. Pour egg mixture into skillet and let sit 30 seconds without stirring. Then use spatula or wooden spoon to stir, lifting and folding from bottom. Continue until eggs are cooked through. Add sliced sausage to pan and stir. Add half of shredded cheese, stir to combine. Fill each tomato with mixture and top each with remaining shredded cheese. 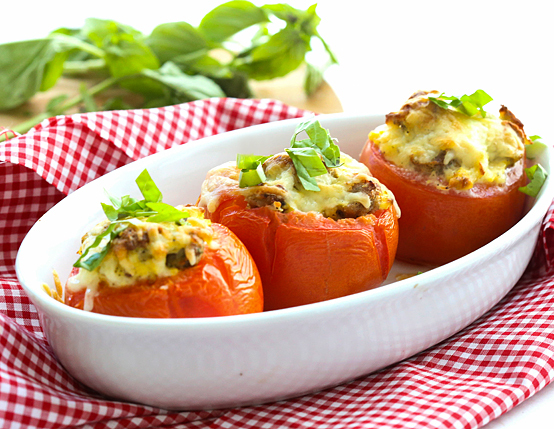 Bake 10-20 minutes, until tomatoes are tender and cheese is melted and bubbly. Sprinkle with fresh basil and serve.